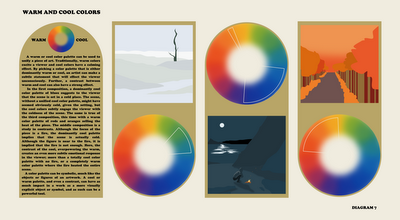 A warm or cool color palette can be used to unify a piece of art. Traditionally, warm colors excite a viewer and cool colors have a calming effect. By picking a color palette that is either dominantly warm or cool, an artist can make a subtle statement that will effect the viewer unconsciously. Further, a contrast between warm and cool can also have a strong effect. In the first composition, a dominantly cool color palette of blues suggests to the viewer that the scene is set in a cold place. The scene, without a unified cool color palette, might have seemed obviously cold, given the setting, but the cool colors subtly engage the viewer with the coldness of the scene. The same is true of the third composition, this time with a warm color palette of reds and oranges selling the heat of the piece. The middle composition is a study in contrasts. Although the focus of the piece is a fire, the dominantly cool palette implies that the scene is actually cold. Although the figure is near to the fire, it is implied that the fire is not enough. Here, the contrast of the cool, overpowering the warm, creates an even more subtle emotional response in the viewer; more than a totally cool color palette with no fire, or a completely warm color palette where the fire heated the entire scene. A color palette can be symbolic, much like the objects or figures of an artwork. A cool or warm palette, and even a contrast, can have as much impact in a work as a more visually explicit object or symbol, and as such can be a powerful tool.